12/10/08 — Fundraising drive — Fontainebleau, Musée national du château — Fontainebleau owns an important collection of old masters, little known to the public as they are exhibited in rooms which are rarely open due to a lack of guards. These works are in many cases former deposits from the Musée du Louvre. This collection contains no less than four major paintings by Francesco Albani, three on copper and one on canvas. 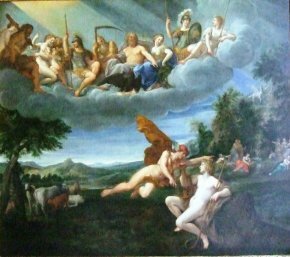 Two of the coppers, Allegory of the Earth (ill. 1) and Allegory of the Heavens (ill. 2) are part of an Elements series which are embodied respectively by the gods of the Earth, Heaven, the Sea and Hell. Carlo Cesare Malvasia, a historian of Bolognese painting and biographer of Albani, points out that this ensemble was commissioned by a Frenchman, Jacques le Veneur, Count of Carrouges. As the count did not appreciate the manner in which the artist represented the male nudes, Hell was probably never painted. The two works already in Fontainebleau have a prestigious past : they were later owned by André Le Nôtre, who then gave them to Louis XIV in 1693. The Louvre deposited them in Fontainebleau in 1875. 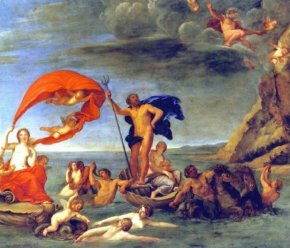 Neptune and Amphitrite (ill. 3) was separated from the other two coppers before these were acquired by Le Nôtre. In the 18th century it once again appeared in the Crozat collection, then in the one belonging to Pierre-Louis-Paul Randon de Boisset. After passing through various hands, including Lucien Bonaparte’s, it ended up in England and was sold on 29 October 1999 at Christie’s London where the present owner purchased it for £683,500. The Caisse des Monuments Historiques, in charge of the château de Carrouges, had tried to acquire it at the time to no avail. A French law on national treasures which allows works held outside the country to be decreed of major importance to its heritage, would today enable this work to be purchased (by way of Christie’s for 1,380,930 €) through patronage. The participating firms would thus benefit from a 90% tax deduction as well as other advantages in communications and public relations. Reuniting these three works seems a better choice than having the painting return to Carrouges after a two-hundred year absence. Not only do we sincerely hope that the acquisition goes through but also that the rooms in the Château at Fontainebleau will finally open for the public. P.S. 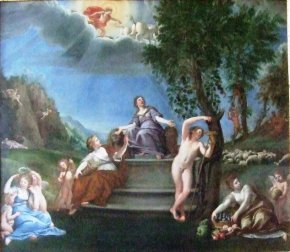 This Allegory was finally bought by Fontainebeau (see news item of 29/3/09).